We are always on the lookout for easy dinners that are healthy without sacrificing flavor. This glazed salmon recipe definitely checks both the nutritious and delicious boxes, and it’s hard to believe it’s so good for you once you taste it’s rich flavor. The trick to making this heart-healthy fish so scrumptious is marinating it in a sweet, salty, and zesty mixture. We reduced the marinade to a syrupy glaze while the salmon baked, and not only smothered our fish in it, but our side dishes as well, it was that good. 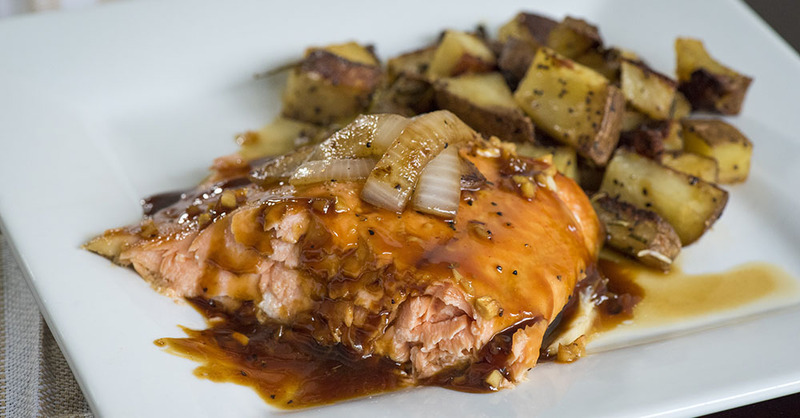 Try this easy and elegant salmon recipe tonight, we know you’ll be hooked!